Vacations and Birth are good for the Soul! Camping and abalone diving are soul restoring events for me. I drink in the beauty-the coastline and the critters that live in the intertidal zone are breathtaking and exhilarating! And the serenity-the gentle ebb and flow of the water in a protected cove and the rhythm of watching the breaking waves on the offshore rock piles is so hypnotic and soothing. And the contentment-surrounded by my friends and family, my “abalone family”, a blending of the people that mean the most to both my husband and I, doing an activity we love, equals soul deep contentment. And the wonder and awe of the world-recognizing all the moments experienced during the trip for how unique and special they are reminds me how wonderful and awesome life is! Vacations should be a journey to be savored. Why not labor too? It is a journey, an experience most of us have only 2.7 times. We encourage people to visualize a happy place during challenging times. So I say this, collect memories of happy places and moments as you go, use them for those challenging times, but also look for those moments during the challenging times. I love the smell of a new Book! I can not say enough good about this book. The first half is full of positive, uplifting birth stories. That is not to say that some of them do not have challenges or complications. The second half of the book then goes on to discuss the challenges. The discussion involves identifying different solutions to the challenges and the how and why of the solution used. This book satisfies the need for real life birth stories and the need for an explanation of the application of certain birth techniques. The Complete Guide! This book is full of information. I would not recommend that an expectant parent read this from beginning to end, rather to use it as a reference book. 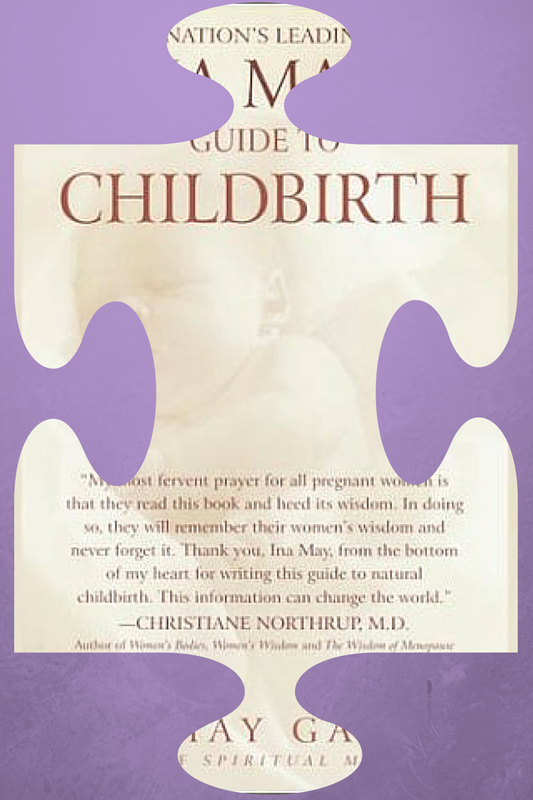 This would be a great book to have and refer to while taking a childbirth preparation class. I take this book with me to all births as a reference material. The charts, graphics, and tables in this book are very comprehensive and easy to understand. This is another one of my favorite reference books. I carry this one to all births as well. I have gleaned some great tips from this book. 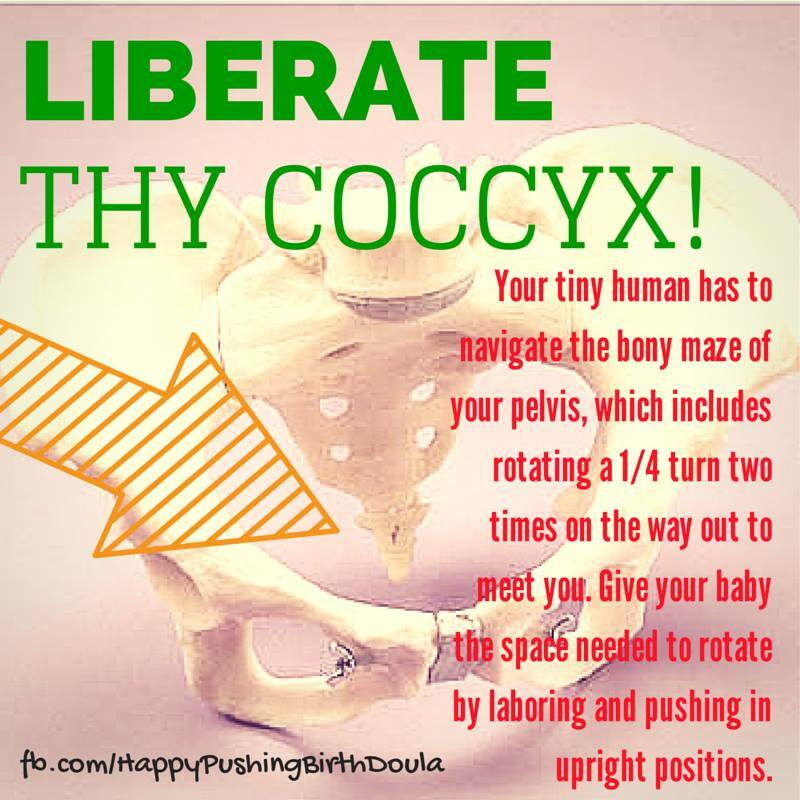 This is a fairly technical read that I would definitely recommend to other birth workers. 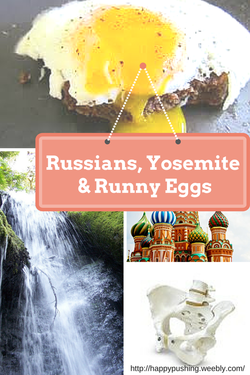 My good friend Stacie Bingham has also listed her fav 5 here. I also like the familiar feel of an old standby. The Outlander series is one of my favorites, anything by Heinlein, Stabenow, or Barr. But it seems that out of all the books that I have had the joy of reading, my books about birth seem to be in my hands more than any others. In fact my first copy of Pregnancy, Childbirth & the Newborn is starting to fall apart. My awesome Mom just got me a copy of the newer edition with the cover shown to the left. So now I get the smell of something new in a familiar format, ah heaven! So I will try to, briefly, explain why the following books are my favorites in no particular order. Some of them were required reading for my doula certification and some of them are to feed my techy, sciency brain and another expands the more flowy, arty, underdeveloped side of my brain. I am still learning from this book. I have to admit I have a fairly logical, sciency brain. This book taps into that underdeveloped side of my brain that deals more with emotions and art and I love it. I would definitely recommend this book to all expectant parents. 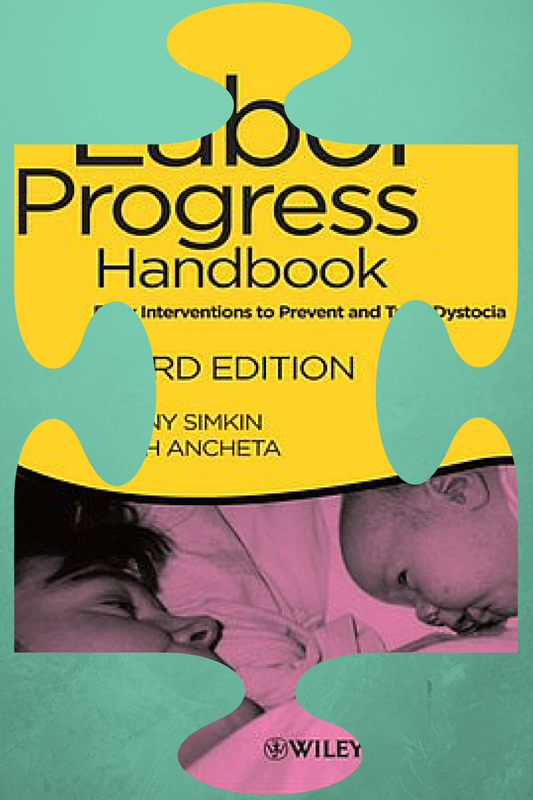 I also plan to utilize some of the concepts from this book in my childbirth education classes. I love the layout of this book. 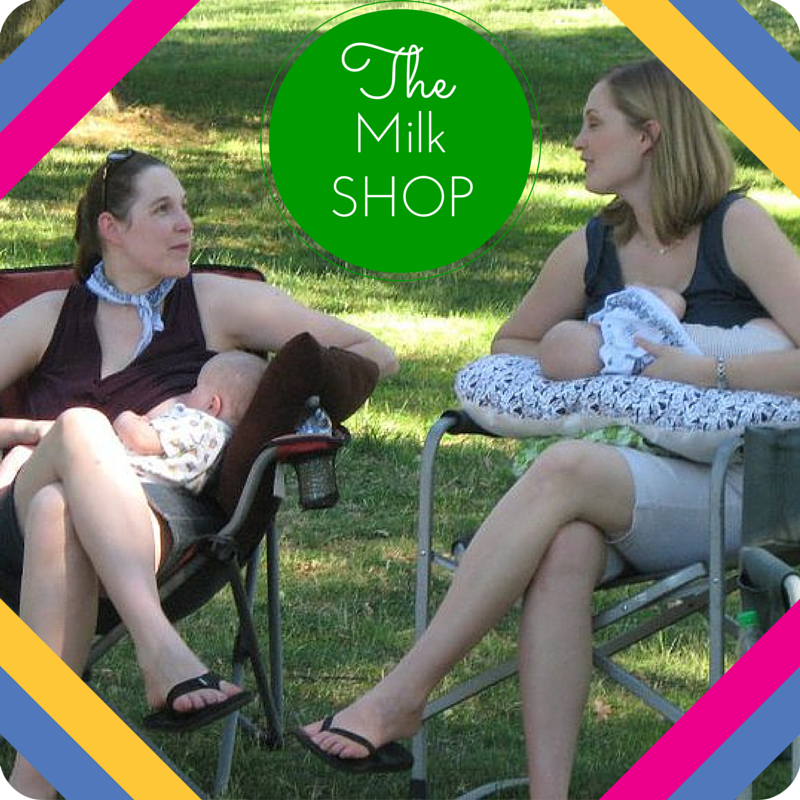 The first part gets you set up to have the support and information you need to have a good breastfeeding experience. The subsequent chapters give you a break down on the common breastfeeding challenges in a chronological order from the first week to beyond six months. The book also addresses mothers and babies that may have special needs, considerations for traveling together or apart, and additional resources for nursing mothers in the appendices. 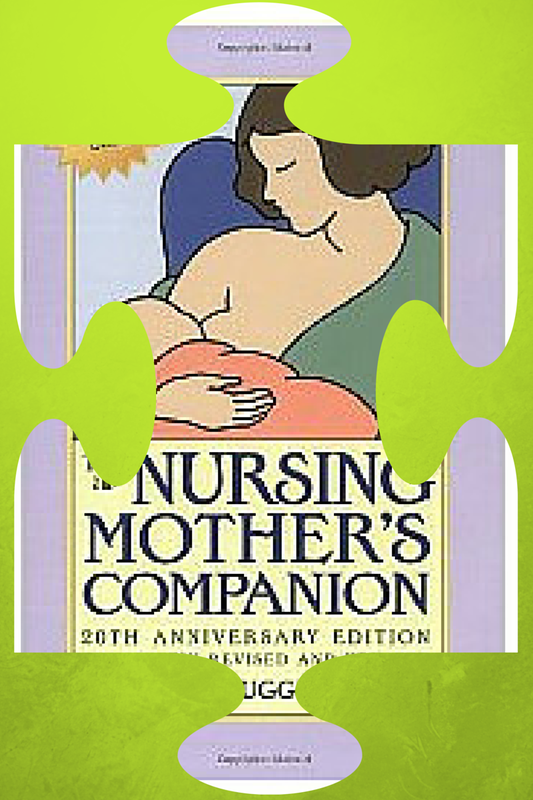 A great reference book for the nursing mother. The ability and process of making decisions begins when we are born. For a period of our childhood we are encouraged to reason things out and make decisions. As we age more and more rules, laws, policies and regulations guide and shape our decisions. Mostly the rules are made for good reasons. Well, they are good reasons for somebody. When it comes to birth, at least in a hospital, we feel there are rules that we should not break. We do not want to upset the staff or go against “policy”. We are vulnerable, and we are about to bring forth from our womb our tiny vulnerable human. We want the staff to like us and take care of us. 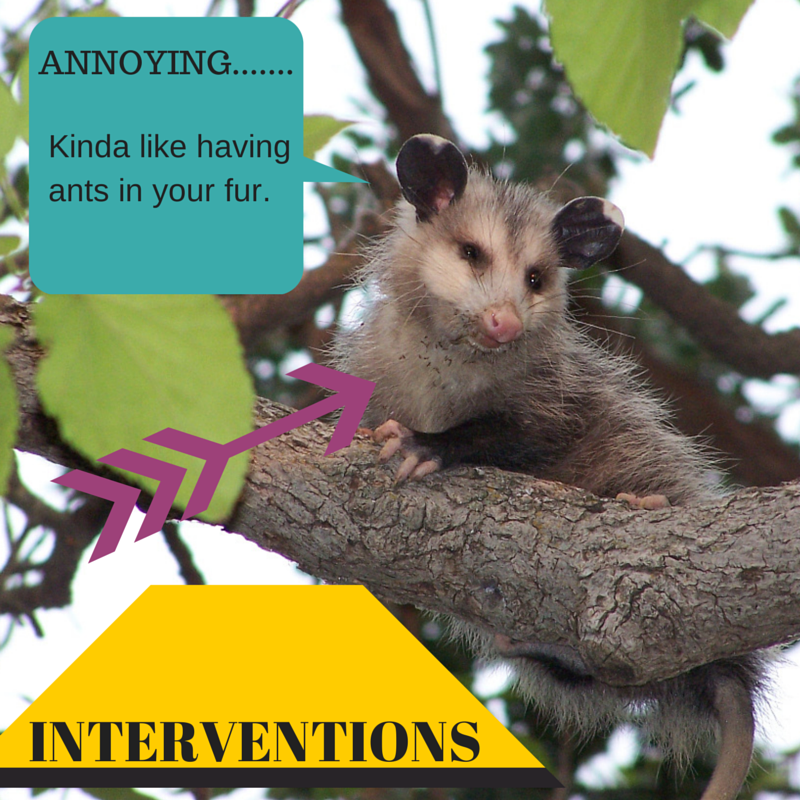 B- What are the benefits of the proposed intervention/procedure? R- What are the risks of the proposed intervention/procedure? A- Alternatives, are there any? How do the alternatives compare in the benefit/risk analysis? I- Intuition. What does your gut/spidey sense/knee-jerk reaction tell you? N- What if you were to do nothing at this time? Or never? 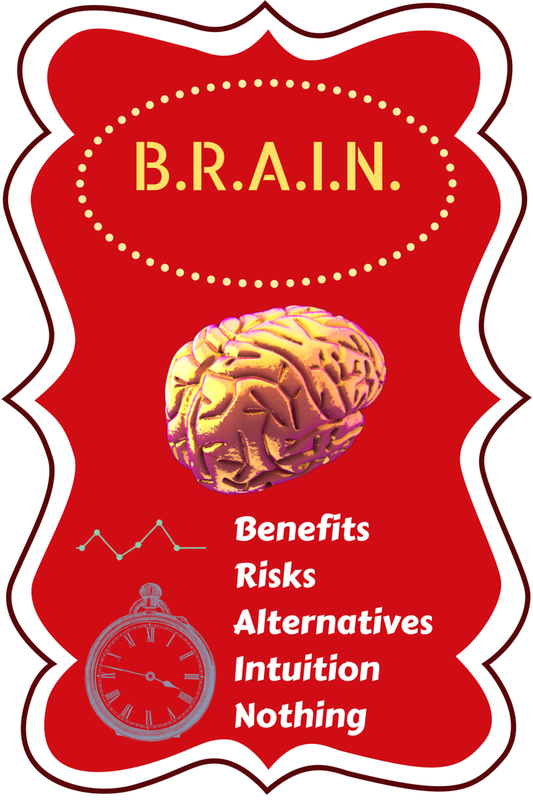 So I challenge you to use BRAIN the next time you go to buy vegetables or bread or meat. Which one is more healthy, which one will take more time to prepare, what could I get instead, what DO I feel like eating, what if I wait and buy groceries tomorrow? New skills take practice. 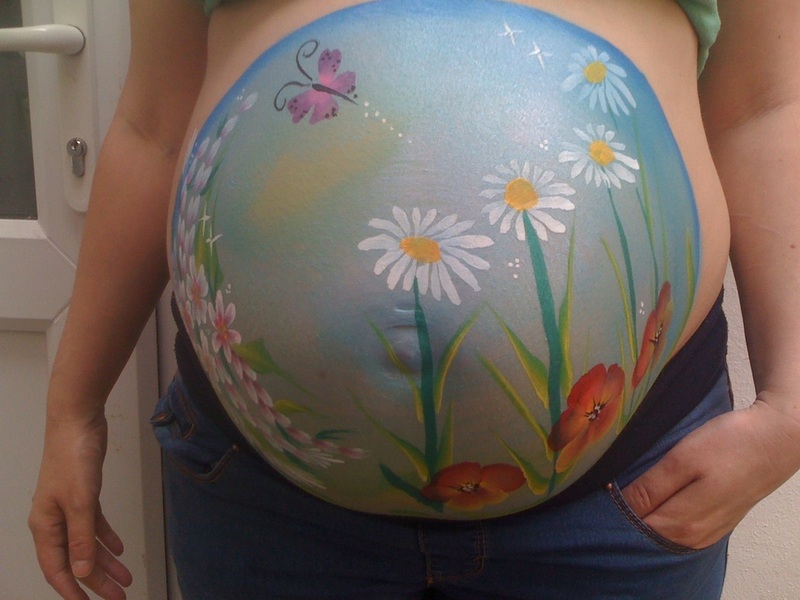 Practice BRAIN as your guess date approaches, so that during labor it will be second nature. I should blog more. It is a way to process life, right? My Life. I wear many hats. I am wife to an awesome man. He makes me laugh. He treats himself, and I, with respect and honesty. I am a mother to two girls. They are perfect. At least I think so. They do well in school and they are well behaved, kind kids. I am a 4-H Leader. For those of you in the know, I don’t need to say more. For those of you that aren't, it is like having a large, extended, sometimes dysfunctional family, which produces some truly well rounded kids to be oh so proud of. I will be talking about birth to an audience that is also interested in birth! I will be educating them on the process of birth. I will be teaching them how to make an informed decision. I will be giving them the confidence to give birth. I will be teaching them about breastfeeding and newborn care. And the frosting on this cake is that some of my students will likely become doula clients! It will be like getting to see the end of the story. 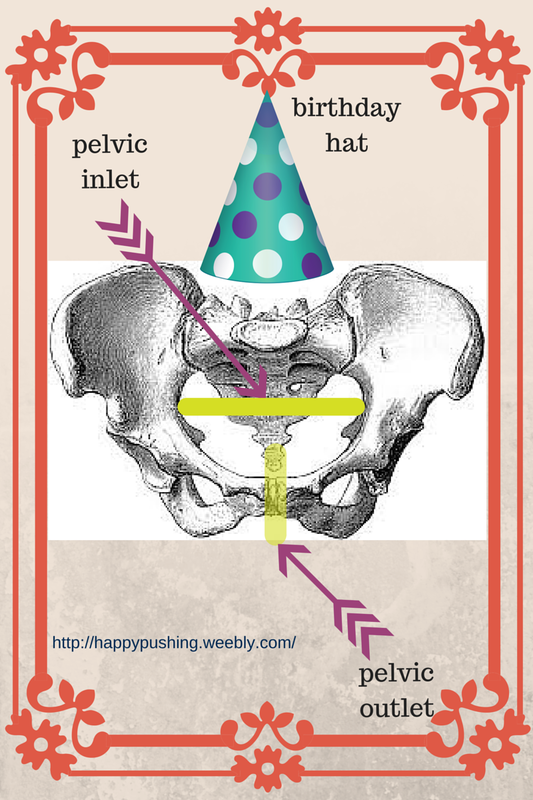 I am so excited about this next step in my birth work journey and the new hat I get to wear! Birth number 4. I decided I was never again going to tell a mom to push. There are plenty of other people in the room willing to do that. Instead, I focus on telling her how well she is doing, wiping her brow, reminding her to take a deep breath for baby, giving her a sip of water. I want a peanut ball. My clients like them and not all hospitals have them. 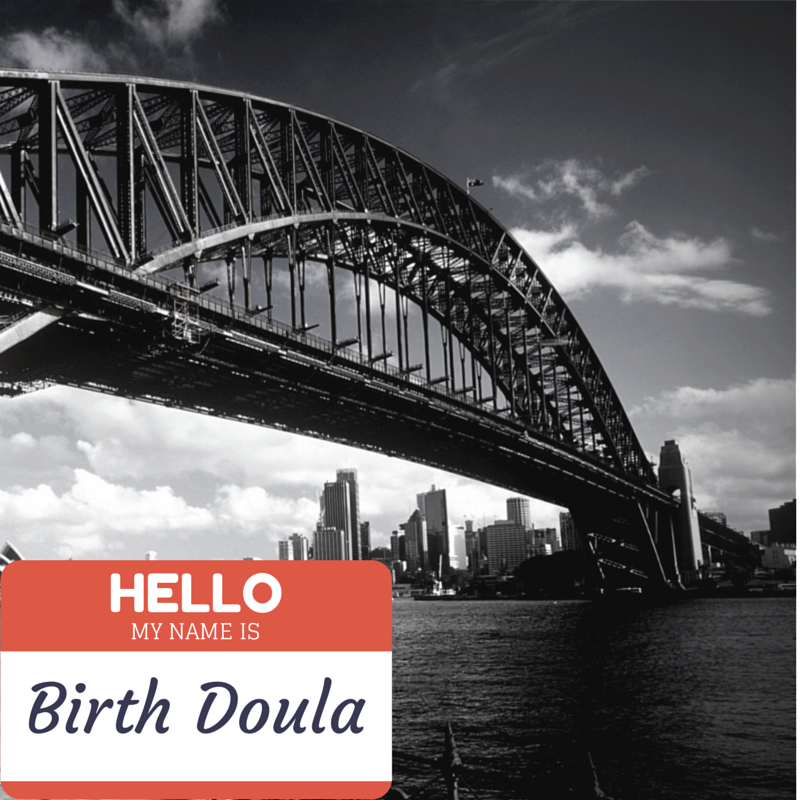 Doula work is my passion. It is an art. It takes creativity, an open mind, empathy, diplomacy, and a willingness to learn. 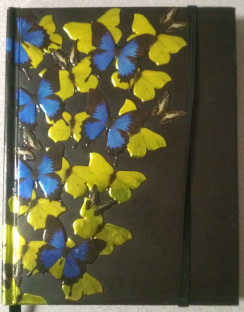 My journal gives me a chance to rejoice at the special memories and acknowledge the things I learned that will make me a better doula at the next birth, and the next birth, and the birth after that. Looking forward to recording my next Happy Pushing memory! I worked with somebody once that had a definite “bubble” of personal space. It was kinda fun to subtly test the limits of those boundaries. I finally determined, through months of occasional observation and experimentation, that the space was 3 feet. Step, even 1-inch, into that invisible 3-foot force-field, and my subject would move away to reestablish the 3-foot bubble. I too have a bubble. When it comes to supporting a woman in childbirth, I temporarily deflate my bubble to support my client AND the rest of her support team. 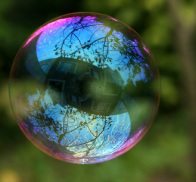 Conversely, I understand that my client may also have that bubble. So, how does that work in such a short amount of time and in such an intimate setting? In a combination of ways. Conversation, empathy, care-taking, simply being, and sometimes, sleep deprivation. Conversation and sleep deprivation. Labor room conversations, at least the ones influenced by my quirky personality, can be hilarious. The people in that labor space learn things that –well, let’s just say that things that happen in the labor space, stay in the labor space. Humans are social. Somebody has a story about skunks, everybody else has to share their story about skunks or some other wildlife interaction, which leads to some other topic like nudist colonies and the technicalities of furniture cleanliness in regard to naked rears. Sleep deprivation just makes it all that much more entertaining. People start shlurring theyr wors an mis..misum.... an people don hwere tings wite. I have huge amounts of empathy. 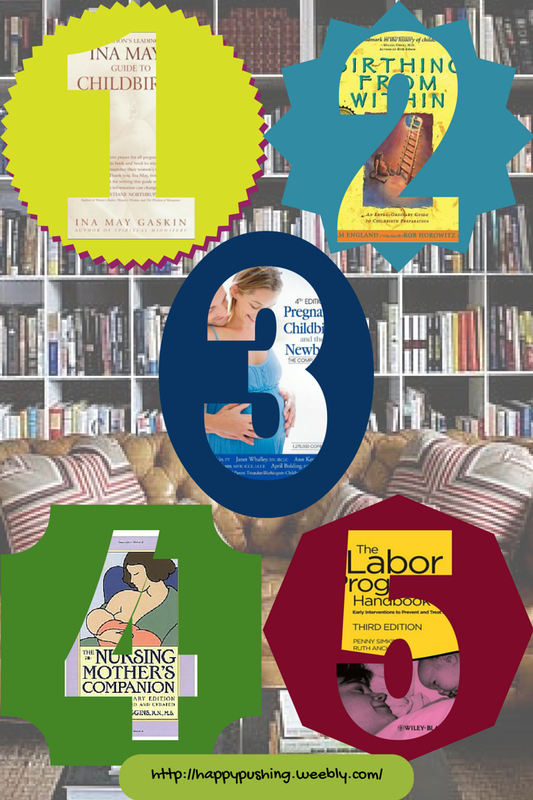 The people that have chosen, or have been chosen, to be in the labor space care about the mama in labor. We all want to make the experience easier in whatever way we can. We cheer her on, we give her water, we massage tense muscles, and tell her how beautiful she is. 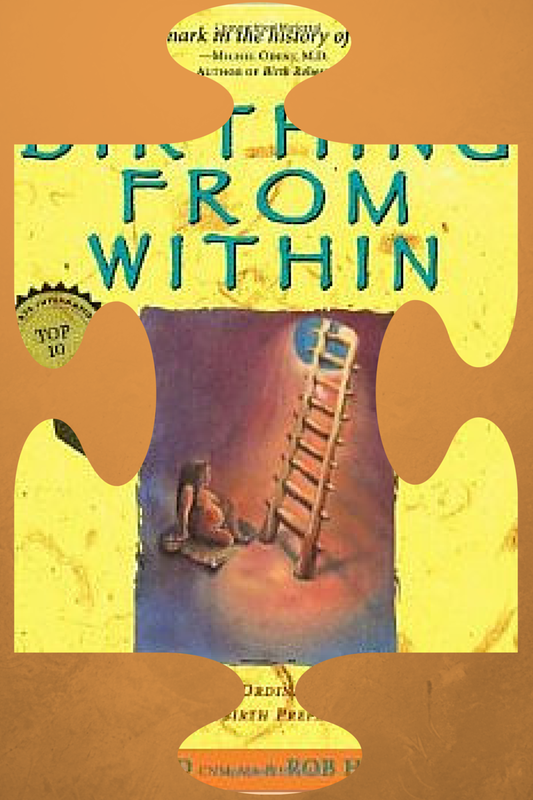 We acknowledge her perception of her experience and help her to see the big picture. We all get giddy when her efforts culminate in 10 glorious centimeters of openness. Pushing is the best. Everybody breathlessly tells her that is the way, just like that, good job…and we grunt and we hold our breath and we push too! The bubble slowly deflates with a soothing of a brow. Light massage. As labor intensifies, the bubble deflates completely. It becomes all hands on deck. Time for position change; One person holds IV lines, another person holds the blankets for privacy screen, another person changes the chux pad, another person physically helps mama roll, the person holding the IV line passes a pillow to the person helping mama roll, the person holding the privacy blanket then wipes mama’s brow with a cool washcloth, and the nurse readjusts the baby monitor-ducking under the person giving the mama a sip of water. 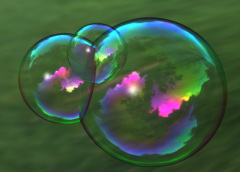 All bubbles deflated, we are all up in one another’s business! Simply being. Probably the most important. The care team for my client become protective. We hold the space, her privacy, her concentration, her focus, her rhythm, her ritual, HER ever-evolving strategy for bringing forth her infant into this world. 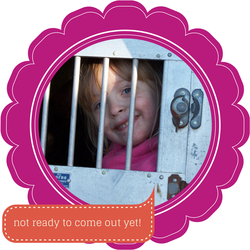 In the early stages of labor, a knock on the door is a welcome distraction. In the final stages, a knock on the door is met with looks of annoyance and protective aggression.